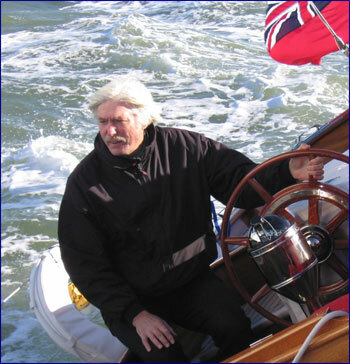 YM columnist Tom Cunliffe – currently in the spotlight with his new TV series on The Boats That Built Britain – will be a guest of Libby Purves on her BBC Radio 4 Midweek programme tomorrow morning (Wednesday) at 0900. Tom’s new TV series, part of BBC 4’s ‘Sea Fever‘ season, looks at the how the sea has helped shape our island, examining the pivotal boats involved in Britain’s exploration, trade, fishing and defence. Tom sails on board six charismatic vessels and even takes to the water in a skip! At 8.30pm tonight he steps aboard the square-rigger Phoenix on BBC 4. Tomorrow night’s programme looks at the Scottish lug-rigged fishing boat, The Reaper. On Saturday, the first two programmes in the six-part series are being repeated on BBC 2. The first looks at The Matthew, the ship that John Cabot sailed to North America in 1497, and the second looks at The Pickle, a replica of the schooner that brought news of Nelson’s victory and death at Trafalgar.